Introducing Our New Range Of Mens All In One Pyjamas. 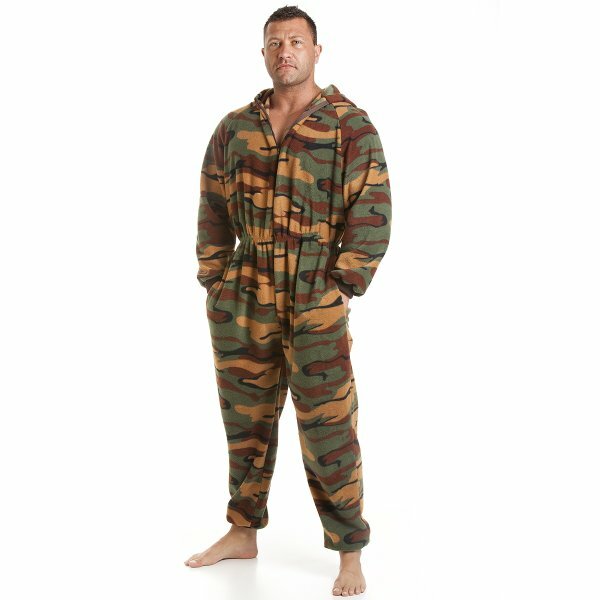 These Mens Onesies Are The Height Of Luxury And Comfort For Bedtime And Evening Wear. This Onesie Features A Green Camouflage Print Which Includes A Hood, It Is Footless And Has A Zip Front. This Perfect Onesie Will Keep You Warm On Cold Winter Nights. Review Summary - 5 out of 5 based on 38 ratings. Bought for my son in law who has totally fallen love with onesies. I suppose it is great to have something to wear when just lounging about that still look decent should anyone drop in unexpectedly. He has even been known to dog-walk in his with a jacket! He loves this latest addition but cant comment about quality or washability or such. Good value for money though.